Good Friday 2019 will be observed by Christians across the world on April 19. On this day, the Christian community commemorates the crucifixion of Jesus Christ with sermons and prayers. The day is observed in what is called the Holy Week or Passion Week, after a month of fasting, called Lent. It is said that Good Friday is one of the oldest Christian holidays and is being observed since 100 CE. How is Good Friday observed? Why is it called Good Friday? Should people send greetings on this day? Many such questions are asked by people around Good Friday. LatestLY brings you the answers to the most frequently asked questions around Good Friday. 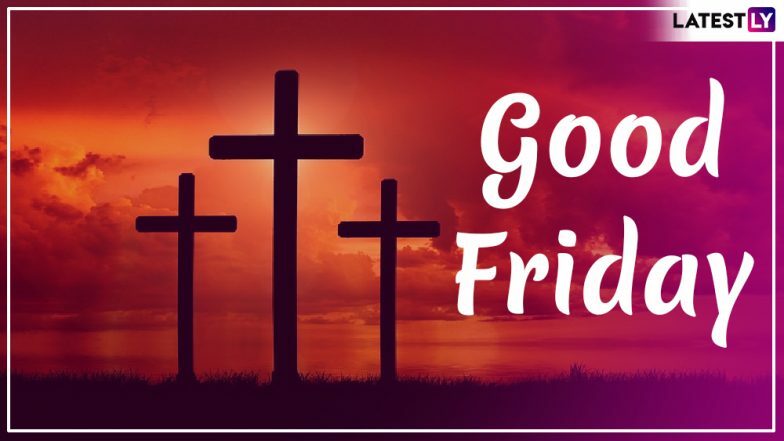 Good Friday 2019 Date: Significance And History of The Day Observed by Christians During Holy Week. Good Friday, also known as Holy Friday, Great Friday and Black Friday in certain traditions, is observed as the day Jesus Christ was crucified. According to The Bible, Jesus Christ was crucified on a cross along with two criminals on either side by the Romans in 33 AD. Scriptures say that there was an earthquake and the veil of the temple where Jesus was crucified was torn in half from top to bottom. It was then declared that 'Truly this was the Son of God!' Following this, Christians observe a day of mourning as Good Friday. Lent 2019 Calendar With Dates Till Easter: What is Lent? Important Facts About the Christian Holy Season. There are several theories around why the day is called Good Friday. While it is a day of mourning, it is said that it is called 'good' because of the deeds of Jesus Christ. Meanwhile, it is also said that in Holy scriptures, 'God' refers to 'Good' and, hence, the Holy Friday is called Good Friday. Should people wish on Good Friday as they do on Christmas? The answer is No. While it is called Good Friday, it is a day of mourning for Christians. Therefore, people should not greet each other with 'Happy Good Friday' wishes just like they may do so on Christmas. It is only two days after Good Friday, that's Easter Sunday, when you must wish 'Happy Easter Sunday'. How do Christians observe Good Friday? Christians around the world observe Good Friday with sermons and prayers. Special sermons are organised at churches around the world where the life of Jesus Christ is explained. This is followed by Easter Sunday, when Christians gather with loved ones and eat different preparations of meat, fish and other delicacies.